As we’ve seen from the weather along the Eastern Seaboard over the last few days, a carport that’s built for the elements is a must. But it’s also important to make it fit well with the rest of your home, as this Sydney carport beautifully demonstrates. 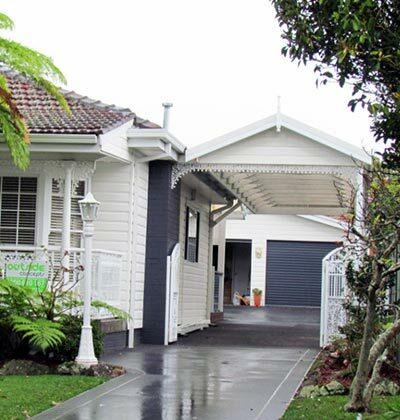 The carport was built in the Sutherland Shire area of Sydney. One of the key requirements of the homeowners was for the carport to perfectly match the home it would be attached to, which is something Mr Carport is often asked to do. When faced with this task there are several aspects that our designers and builders consider. Things like the materials used in the house, any decorative elements, the roof shape of the house and colours. It’s this attention to detail that makes all the difference when looking for a carport that’s a perfect fit. In the case of this Sydney carport, which is two cars long, elements such as the posts, decorative fretwork and the end-fill were keys. And everything was painted in white to match the rest of the house. The result is a carport that you’d be hard-pressed to notice wasn’t built at the same time as the house. Thank you for your professional service and installation of the carport. We are both pleased and proud of the workmanship you facilitated throughout the installation. We are happy to recommend your company if and when requested. Thanking you again. Want to build your own picture-perfect Sydney carport? Give Mr Carports a call on 1800 557 782 or go to our Sydney branch page for more information.